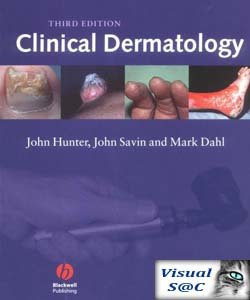 Five years is a long time in modern medicine, and we feel that the moment has come for Clinical Dermatology to move into its third edition. As before, every chapter has been updated extensively, but our aim is still the sameato create an easily read text that will help family doctors to get to grips with a subject many still find confusing, despite the increasingly stodgy sets of guidelines that now land regularly on their desks. We have selected the best elements of these guidelines for our new sections on treatment, which are therefore much more ‘evidence based’. However, if we had to include only treatments based on flawless evidence, we would have to leave out too many old favourites that have stood the test of time, but have still not been evaluated properly. Next time perhaps. Hola pura vida saludes, gracias por sus aportes están increibles,aprovecho para saber si me pueden brindar su ayuda con algún libro que trate de DERMATOLOGIA en español, u otro que me diga algo acerca de los hongos en la piel, tengo un hijo con un hongo creo que se llama TIÑA CAPIS y quisiera saber el tratamiento, muy agradecido, sigan adelante.